The first Henry C. Martin estate designed by Harrie Lindeberg c. 1914 in Glen Cove. Click HERE to see a brochure from when the Martin's subsequent Lindeberg designed residence was for sale. This residence was demolished sometime prior to 1939. Photo from Arts & Decoration, 1919. Looking at the Bing view of the property today - is that a school or a club across the street from the estate? 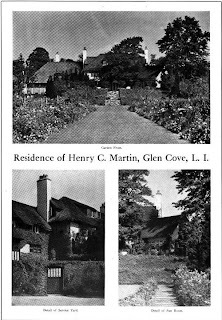 The real estate brochure from back in the day with the manor covered in that rich ivy is simply delicious. I think the North Country Day School complex is across the street. This estate is equally well maintained as the nearby Luckenbeck estate Cobble Court. Appears to be located in a lovely intact neighborhood. Old Gray Dog has brought to my attention a rather glaring discrepancy between this image of the Martin house and the brochure image (which reflects the current house). Magnus would know better than I...did the house undergo substantial alterations years and years ago or did Martin own two Lindeberg houses in Glen Cove? Zach: I tried to respond earlier, but for some reason, the blasted security words weren't appearing. As an aside- if you really want a surreal experience, opt for the vocalization of the security words- it sounds like an old LP played at half speed- and utterly unintelligable. This is definitely a different house than the Lindeberg house which appears in the sales brochure. I had always been told that the Martins purchased Groendak, the CPH Gilbert designed Parker Handy house and either tore it down or replaced it when it burned by the house in the sales brochure. I was not aware that there was an intervening house on the property. It is also fairly apparent to me that the current house (in the brochure) was built from "whole cloth" and not a redo of the house in today's post. Could the Martins have had another house in Glen Cove? NYTimes, Feb 5, 1923: "Mrs. RL Davisson risks life to save cat. $150,000 Glen Cove mansion destroyed". The article went on to describe a fire that had destroyed the Henry C. Martin residence ajoining the Nassau Country Club (some 3 or 4 miles south of the later Martin house in North Country Colony). The article mentioned that Martin had recently sold the house to William N. Dykman, head of the NYBar Association, but it was unclear if title had actually passed. My guess is that today's post is of this earlier Martin house. By the way, Mrs. R.L Davisson was the former Helen Porter who later, as Mrs. Paul Pryibil, would build Bogheid, the subject of several wonderful posts by Zach. Thank you. So the location discrepancy would explain why I could not find it on the older maps...I was looking in the wrong place entirely. Looking at the 1914 map I see a Peter Martin listed on a parcel which abuts the Nassau County Club. On the 1927 map that same parcel says Marin Estate. Oddly enough I do not see Dykman's name anywhere on the '27 map. Anything that sat at the location has since been demolished as well. Peter Martin is listed on the same parcel on the 1906 map as well. By the 1939 map the surrounding area had been demolished and redeveloped so this one went down quite early on. So at a very minimum this seems to be a previously unknown commission. It's not in the Lindeberg monograph, not in the SPLIA book and the only Martin entry in the Spinzia book is for the current residence. Questions arise - Who was Peter Martin? Dkyman had Lindeberg build "White Acre" in 1920, this house burned in 1923. Did he need two? Would Dkyman's daughter in-law move someone else furniture into their home? She lived in the Meadow Springs development across from "White Acre" with Dkyman's son Jackson. I had the garden photo and was prompted to post on my blog along with the NYTimes article on the fire.